for the past weekend, due to my husband’s work, i had a chance to go along with him to shimoda, the southernmost point of izu peninsula in shizuoka prefecture, south west of tokyo. his (and his partner’s) architectural office has been commissioned to work on a resort development project down there by the shore. after a 3-hour train ride from tokyo main terminal, we arrived in the small town of shimoda, where all the chaos we encounter in our everyday urban life seems to be nonexistent. 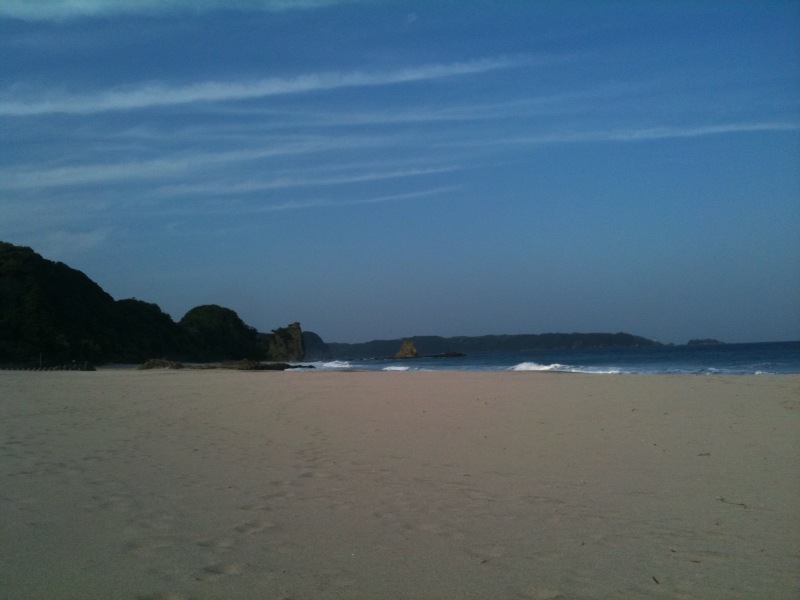 while they went for a walk-through on the site with the client, i went alone to an almost deserted beach nearby. at the off-season beach, there was hardly anyone except for a few surfers, despite the lovely weather with amazing sunshine and gentle sea breeze. it was literally a paradise and a perfect get-away to me. sitting alone on the white sand, looking at the waves, feeling the breeze softly touching my cheeks and hearing the sound of ripple in the back of my head, i started remembering how much i had craved for being where i was that day. i grew up in a small inland city of japan where the city/prefecture boarder did not touch any ocean. the city is surrounded by the mountains, which creates a quite protective mentality in its inhabitants. naturally people are very conservative, and they don’t seem to know that you can have different views. mostly because of it, i always felt captured and oppressed, wanting so much to escape to somewhere out there, with more potential in life, with more exposure to the outside world. in some place yet to be seen, i used to think, there must be a perfect location where i completely fit in. by being close to the sea or a river or a metropolitan city, i believed that i could get out anytime, to anywhere i wanted to go. by the time i hit my adolescent period, the feeling got stronger and i often dreamed of putting myself to a bigger scale of the world, hoping that such place would exist, where i would feel fully satisfied at last. with a twist of fate i left my suburban city shortly after that, and from then on i moved around the world. in america i lived by the atlantic ocean, and in australia i lived next to the tasman sea. in the u.k. i lived in london which is considered to be one of the biggest cities in the whole world. in italy i was in milan, where i had an easy access to travel freely to anywhere in europe. in theory i had a perfect environment, but i am not sure if i can truly admit that i was entirely happy and that my life turned out to be the one i had always wanted. because wherever i went, wherever i traveled, i always, without any failure, started missing my family and longed for intimacy. what i had thought was an escape became a torture, and every time that happened i resigned to my emotional craving and came back to my comfort zone. my mind drifted back to the deserted beach when i heard my husband’s footsteps, and i realised what a pleasure it could be to have a place to escape, when you knew for sure that there was a place you could go back to, to something real and truly genuine. after all it is not a physical location which makes you feel fulfilled. i can say it now that it is more of an emotional well-being which dictates the level of your fulfillment. a vast landscape of the ocean extends in front of me, but i don’t have any desire to escape now – i love my life now, and i know it for sure. 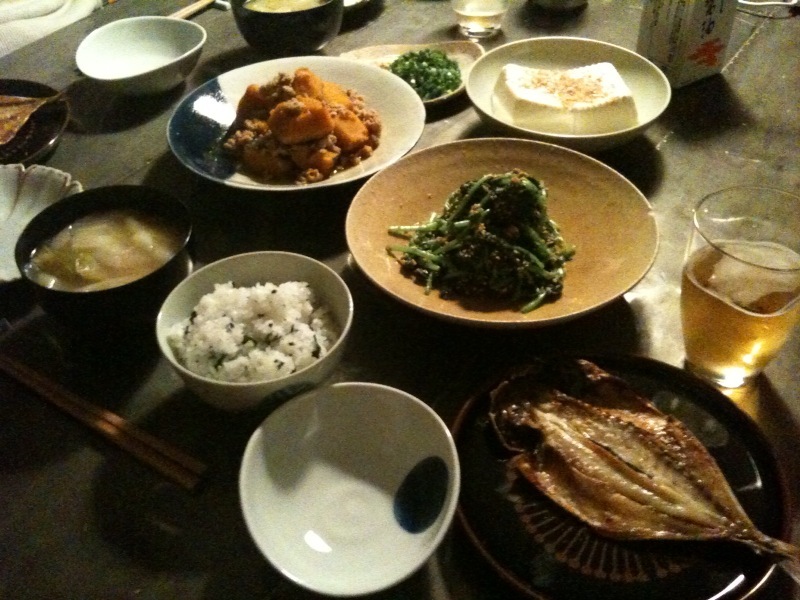 in the japanese kitchen, there are many dishes which are influenced by cuisines from other countries. curry & rice, one of the earlier japanese dishes i posted for example, is influenced by (obviously) the indian. 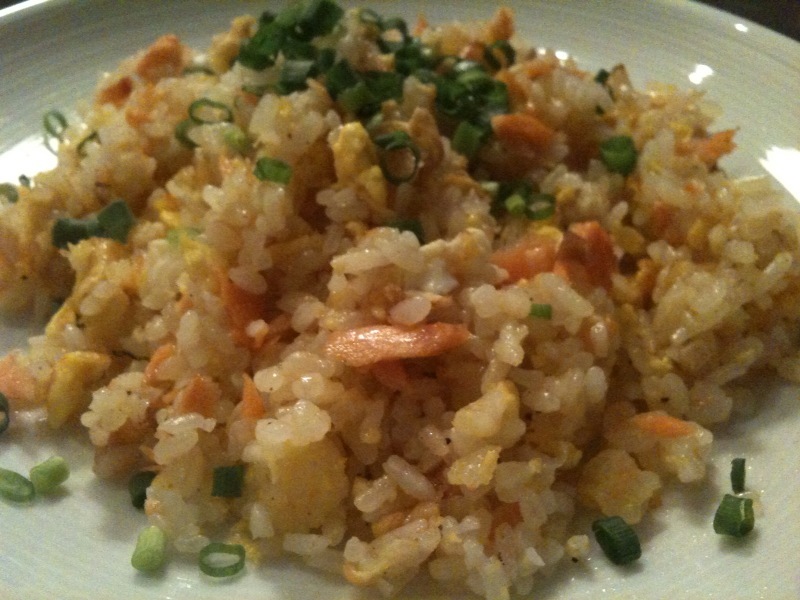 6. when serving, sprinkle the spring onion/chives over the fried rice. the entire steps from 1 – 5 only takes about 5 minutes or so (or even less). do every step very quickly, in order to avoid the rice from getting soggy and sticky. 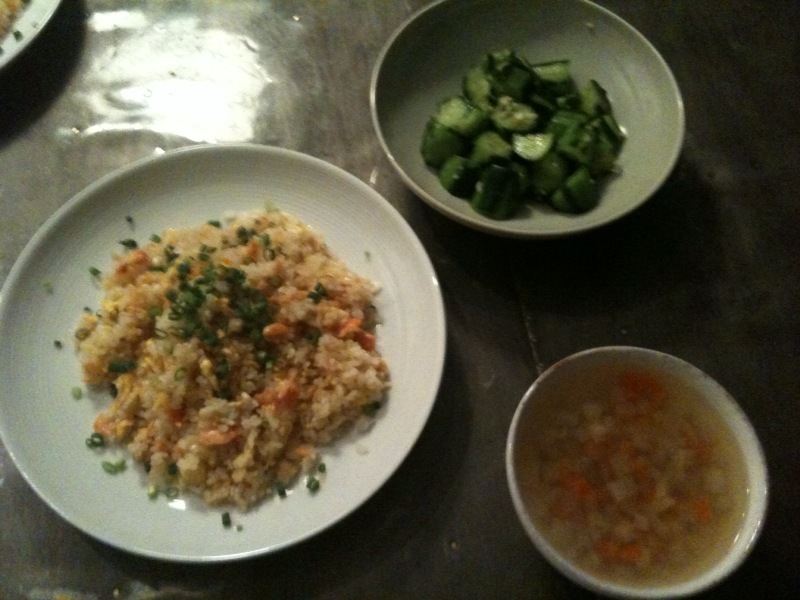 this time, i served the fried rice with vegetable soup (in chicken broth) and cucumber salad. today, out of these dishes, i would like to share a recipe for “hourenso no goma-ae“, boiled spinach in japanese sesame sauce. it is a nutritious, healthy, totally vegan side dish. 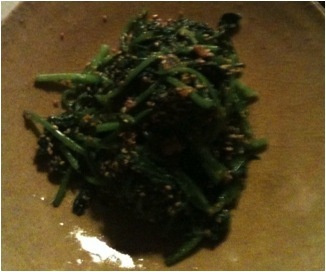 the iron taste of spinach matches perfectly with the mild yet strong flavour of sesame, which is nicely combined with the soy sauce. that’s it – so easy and tasty. not to mention, my stomach was fully satisfied at the end of the meal. there is no place, like home. 2 months have past since the Tohoku/Kanto earthquake on 11th of march 2011. the terrain seems to have calmed down finally (at least in Tokyo), and our life is almost back to normal. i still get a bit sensitive from time to time, whenever our furniture makes some squeaky sound or the apartment gets vibrated slightly from a truck passing by our street. when that happens i get tense for a second, but resume my daily life right after. most of the time i spend a day without thinking about the threat from the ground, which is a great relief. under the extreme circumstances of the disaster, i have witnessed these fundamental differences in people’s mindset, and realised how much influence we are prone to get depending on where you grow up, how you are brought up, and whom you grow up with. as mentioned earlier, i believe there is no right or wrong in whichever you react. it’s just the differences in mentality and values which are built on years and years of history around the world. one thing i can say is, being a native of a mono-cultural society, we are expected, by our fellow country people, to act in certain ways to conform to what the society believes in. in such environment, sometimes it can be hard to have differences in opinion, especially when you are exposed to a multitude of ideas and are surrounded by a diversified group of people. being among different cultures, ethics and ideologies, sometimes it gets pretty confusing in regards to what i should or want to have faith in. of course i am proud to be japanese and love our culture dearly, but on the other hand there are certain ideas that i do not agree to, but i find it hard to voice it. i am afraid of not being accepted, and am scared of being regarded as a traitor. perhaps this characteristic itself is the most japanese quality that i possess and try so hard to disguise.